In past few weeks I received some questions from my readers by email and by comments on my post (Specially from Manolo and Kurtulus once Monolo has shown his aggression also due to delay in response) and here I am trying to answer those Question. I am sorry friend for responding late as I was busy with some assignments and was not able to spent time on blogs. I would like Death to be like you. Just make promises with no execution. Or did you guys in India stop time and "next 24hrs" still have not passed ? Can you say in which cases QlikView is not the right solution? Question 2- If QlikView has any drawbacks at all. And OLAP based tools are normally handled by highly trained Specialized IT Person or mid level guy. Top bosses still use excel sheets as they are very rigid to learn a new technology. Then what is the role of QlikView in this environment? 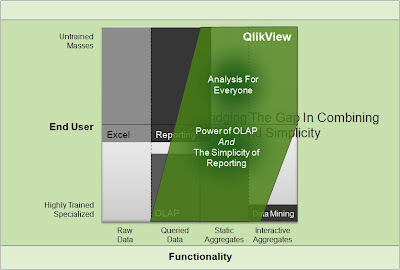 Above picture describe what are the areas QlikView can cover (See Green Area in picture above) when it come to delivering information to end users. There are some areas of reporting which are Interactive aggregates QlikView Covers this part also up-to 85-90 % ( See Bottom right of the picture) and these areas are very Niche areas and there are some Niche tool which take care of it I know SAS is one of them. Over all conclusions is that QlikView is the only alternative/ for OLAP based tool and it gives you more than what you have expectation with a BI tool. And its GUI also is not very much different than what decision makers ( Actually they are those who have more critical requirements than any one at Organization) are looking in excel sheets and that is the reason users can learn quickly how to use QlikView. 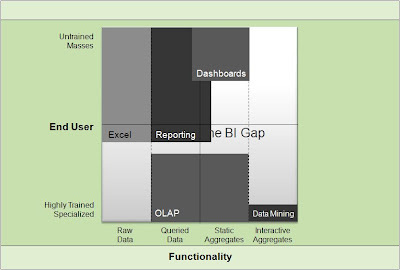 Curious why you don't feel OLAP would be completely covered by Qlikview? Where are the drawbacks? or you mean to say QlikView is perfect? I like qlikview a lot. As I said, it's extemely powerfull in several areas of Business Intelligence. I also acknowledge the fact that it's deployment time is fast and customer statisfaction is high. But claiming that you don't need any form of propagation of data when you have QV is a bit short-sighted. And I am not talking about the extreme privacy regulations in government that screams for datamanagement and sophisticated security architecture accompanying your data as well as your BI. And I am not talking about metadata management control. A pillar where any sound data management architecture must be build upon. They wanted to know about drawbacks of QlikView but have no guts to accept what are the areas where OLAP is failing.. What are the resions why OLAP based/ Data ware house based tools become an IT tool only. Why The core user group who are the decision makers at any enterprise are not using most of OLAP implementations. ITs easy to create an SRS and to deliver acording that bt what if there is change request/ or if the requirments are ad-hock?? If an user want to add new dimetions or want to delet existing dimention from a report?? Dose OLAP based tools have any solution for this?? I just heard that Version 9 has something called personal edition which does not require any license key and can be used for unlimited period. Please let me know what exactly is this. If this is true, its a very good news for small business owners to get a feel of it and use it for their analysis. and under "Highlights of QlikView 9 include:"
"QlikView Personal Edition—Free downloadable developer tool for personal use "
Oracle provides free lunch for unlimited period of time. You can download any Oracle software and use it or evaluate it free for as long as you wish. Are you based out of india. If so, there is a product called as one key that is selling quite well and offers extremely fast analysis including dimensions, is as easy to set up as qlikview though the dashboard reporting leaves quite a bit to be desired. Wat are your comments on the same? 1. According to the article here: http://tinyurl.com/2euaufc in-memory technology has distinct disadvantages, in respect to scalability and user concurrency. 2. One distinct advantage OLAP has over QlikView is the existence of a dimensional model, that both makes it easier to reuse physical models for multiple applications, as well as allow more ad-hoc flexibility for the end user. QlikView is not necessarily cheaper than OLAP solutions in terms of TCO. However, they have a clear advantage as they are able to provide value faster than OLAP solutions. But if you look at it over the stretch of a year or two, you don't pay significantly less. You spend quite a bit on hardware as well as professional services. 2-In OLAP dimensional Model looks useful till time you have limited dimensions. As many as dimensions you have in OLAP (Mainly in at Cubes) it results in performance issue. Whereas QlikView gives you N- Dimensional analysis. Here in QlikView you do not have pre defined “Cubes” and every “Click” creates a logical cube inside QlikView document that helps an end user to have more flexibility in ad-hock reporting. 3- QlikView gives you less than 5 % dependency on vendor and one person from customer’s IT department is sufficient to handle QlikView development for ad-hock need or for ongoing reporting if he spend average 3Hrs/Month on QlikView. I have my own customers who have purchased hardly 5-10 days of services in last 3.5 years after implementing QlikView. Apart from that I have many customers who have implemented QlikView by their own after getting 5- days training from us. 1- You should read it. It's at the very least insightful. 3- That is inaccurate, I believe, at least from my experience. You would typically need one person per QlikView model/app. Not per the entire solution. community where I can get opinions from other knowledgeable individuals that share the same interest. If you have any recommendations, please let me know. Thank you!